ESA's planet-defending Hera mission will set a new record in space. 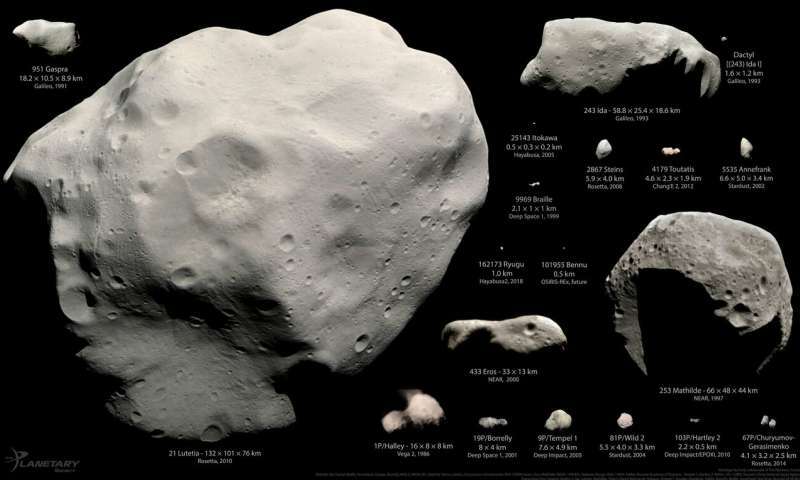 The asteroid investigator will not only be the first spacecraft to explore a binary asteroid system – the Didymos pair – but the smaller of these two worldlets, comparable in size to Egypt's Great Pyramid of Giza, will become the smallest asteroid ever visited. 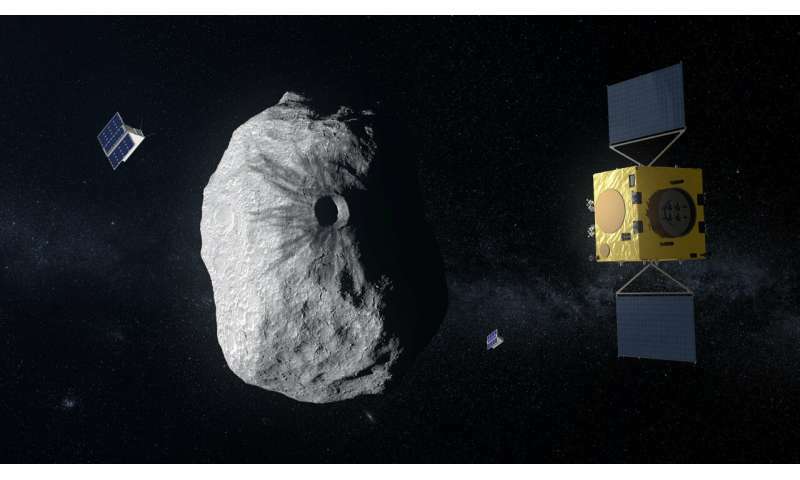 Didymos itself is just 780 m across – smaller than any asteroid visited by a probe other than the 350-m diameter Itokawa rubble pile visited by Japan's first Hayabusa spacecraft and the 500 m-diameter Bennu, around which NASA's Osiris-REx mission is currently in orbit. That leaves Didymos's orbiting moonlet 'Didymoon' as the smallest of all asteroids scheduled for robotic inspection, at just 160 m across. 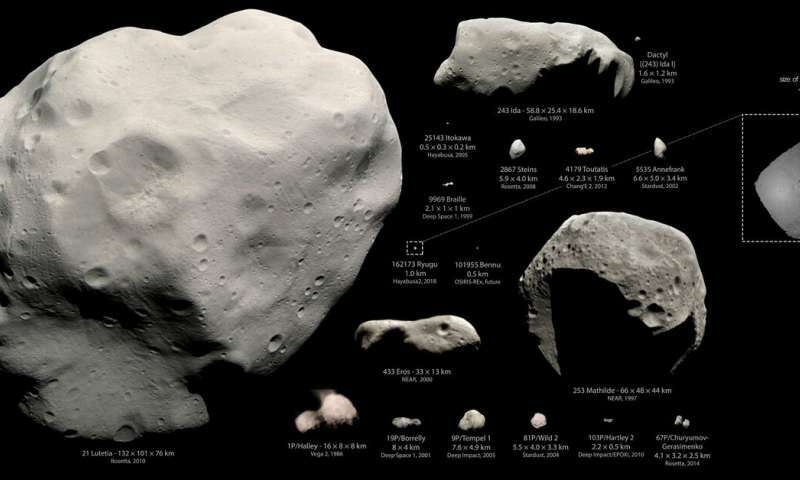 "Didymoon's miniscule size really becomes clear when you look at other asteroids," comments Hera's lead scientist Patrick Michel, CNRS Director of Research of France's Côte d'Azur Observatory. 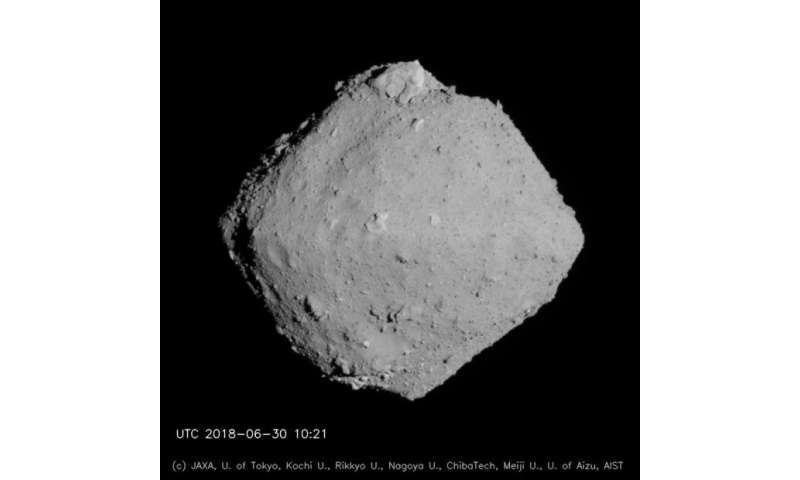 Patrick also serves as co-investigator and interdisciplinary scientist on Japan's Hayabusa2 mission to the Ryugu asteroid, which is about 1 km in diameter: "Hayabusa2 images show a large boulder near the north pole of Ryugu – and that single boulder is about the same size as Didymoon in its entirety." Its diminutive size was the reason Didymoon was chosen for a pioneering planetary defence experiment. 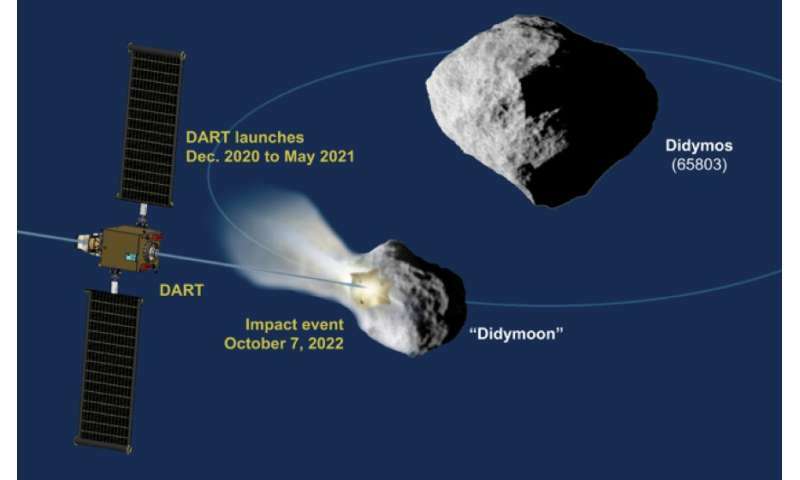 In 2022, NASA's DART spacecraft will impact Didymoon in an attempt to change its orbit around its larger twin, to test the feasibility of asteroid deflection. 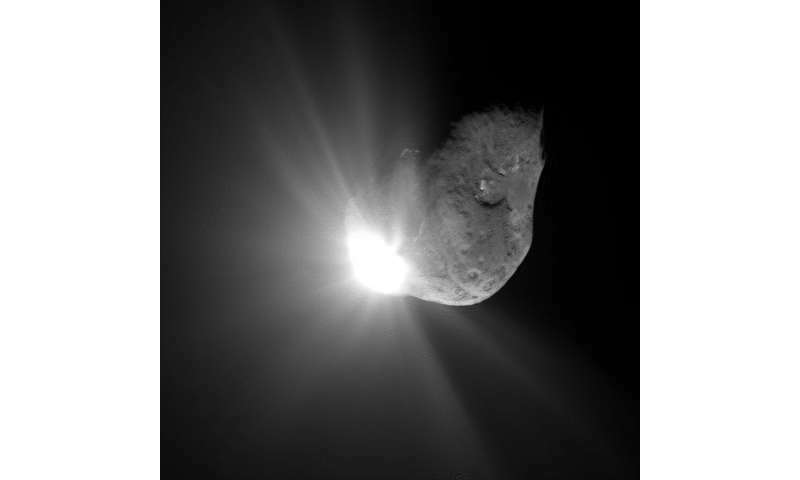 "This isn't the first spacecraft impact into a planetary body," adds Patrick, "NASA's Deep Impact crashed into comet Tempel 1 in 2005, but not to try and deflect it, instead it was to expose subsurface material – the 6-km diameter body was much too large. But Didymoon is small enough, and in a tight enough 12-hour orbit around its parent, that its orbital period can indeed be shifted in a measurable way." After the impact, Hera will survey the Didymos asteroids in 2026 to gather key information that will not be available from Earth-based observations, including Didymoon's mass, its surface properties and the shape of DART's crater. 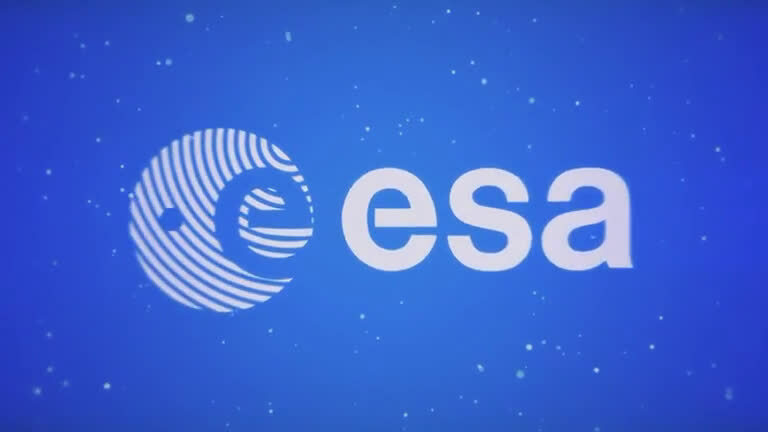 "This will give us a good estimate of the impact's momentum transfer, and hence its efficiency as a deflection technique," explains ESA's Hera project scientist, Michael Küppers. "These are fundamental parameters to enable the validation of numerical impact models necessary to design future deflection missions. We will better understand whether this technique can be used even for larger asteroids, giving us certainty we could protect our home planet if needed." "Didymos is spinning very swiftly, rotating once every two hours," says Patrick. "Around its equator, its weak pull of gravity could be overcome by centrifugal force, potentially leading to material rising from the surface – the leading theory of where Didymoon came from. So landing on the equator would be impossible; you would have to touch down near its poles instead. "Didymoon's small size means we know little about it, but we assume it would be spin-locked around its parent like Earth's moon, implying a slower spin equal to its orbital period. The plan is to land at least one CubeSat there, although it will require precise navigation to achieve this. The asteroid will have something like one millionth of Earth's gravity, with an estimated escape velocity of just 6 cm per second, so one danger might be bouncing back out to space." Hera is currently under study to be presented for approval by ESA's Space19+ Council meeting of European space ministers. It is planned for launch in 2023. Hera would be ESA's next mission to a small body after the Rosetta comet-chaser, benefiting from the expertise acquired during that 12-year mission. Long-term planning is crucial to realise future missions, and to ensure the continued development of innovative technology, inspiring new generations of European scientists and engineers.